Kemco has found a comfortable niche on the eShop; over the past few years, the publisher has been steadily putting out budget JRPGs ported from mobile, from Grinsia to Justice Chronicles. They vary in quality, but their mission remains the same: to provide low-priced, nostalgia-tinged JRPG goodness. As the latest in the lineup, Infinite Dunamis doesn't do too much to shake things up, but it stands out as one of the publisher's better RPG efforts; like its half-robotic heroine, it has more heart than most of its ilk. Infinite Dunamis takes place in a world of tenuous peace. 15 years before our story starts two large empires, Eleftheria and Valtenia, have put aside their previous differences to fight against a common foe: robots, originally built as weapons by Valtenia, who rose up against their masters and threatened to wipe out the human race. 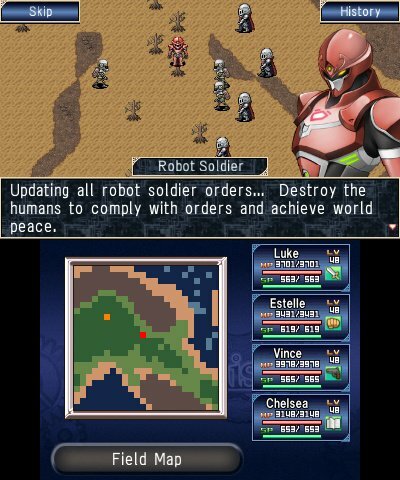 In the wake of that conflict, the two kingdoms have sworn off both war and robots, but rumblings in Valtenia point towards a coming clash. It's in this context that we meet Luke, a young adventurer-tinkerer obsessed with robots, and the half-robot, half-human Estelle he finds and pieces back together soon after the start. Their adventure takes them across empires as they work to preserve peace and put an end to conflict in this subtly steampunk world. 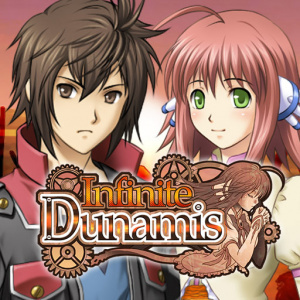 While it's not exactly groundbreaking, Infinite Dunamis earns points for delivering its sci-fi story in an appealing way; the writing is well done, with fun turns of phrase and none of the translation wonkiness often seen in budget JRPGs, and we found ourselves smiling and sometimes even laughing along with the script. 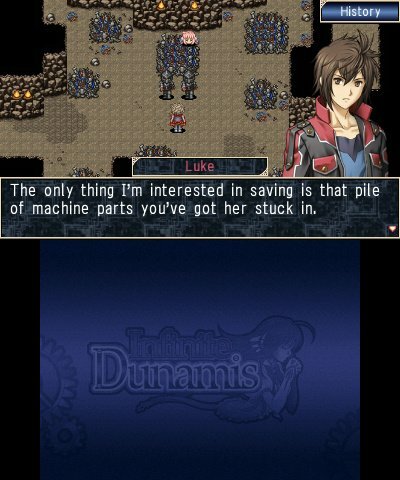 Character interactions are particularly fun — Luke's otherwise 'x-treme' edginess is balanced out by his wide-eyed love of robots, which comes out especially during his kid-in-a-candy-shop conversations with Estelle, whose endearing optimism is continually charming. 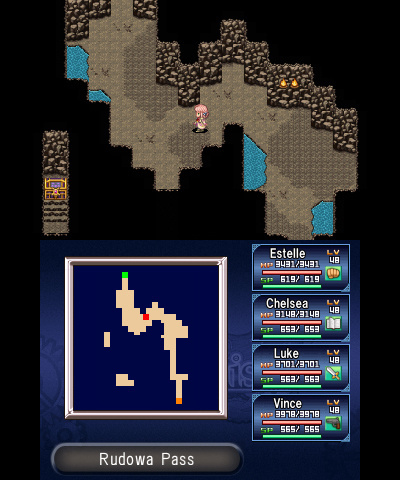 In gameplay terms, Infinite Dunamis takes place in a classic JRPG template, with overhead movement, random battles, towns and dungeons to explore, and a Dragon Quest-style overworld to connect them. 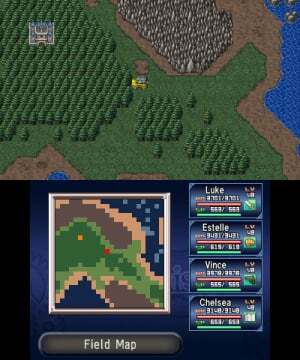 It's all very familiar for veterans of the genre, but there a few thoughtful touches to help things run smoothly, like the same pixelated HUD map on the touchscreen as in Justice Chronicles, and an EarthBound-style option to auto-complete low-level enemy encounters. Battles likewise take their cues from the standard turn-based template — with characters being able to attack, defend, or use magic/skills — but come with some unique touches. For starters, you'll have both vanguard and rearguard positions to work with in your party, with the front lines gaining a boost to damage (both dished out and received) and those in the rear playing it safe (with less damage in both directions). There's also a dynamic turn bar at the top of the screen to show who's up next, with separate lines for party characters and enemies. The actions a character takes influence how soon they'll be able to act again, which adds a welcome element of both strategy and unpredictability to battles; you might decide to have a character guard for a turn so your party can gang up on foes all at once, or enemies might do the same, jumping forward in the queue to throw off your targeting choices. By far the best addition to Infinite Dunamis' battle system, however, is the presence of Gaia Icons. These symbols occupy a third line on the turn bar, in-between player and enemy characters, and they stream along from right to left independently of all other actions. Depending on their symbol, they can cause various effects when they reach the leftmost edge of the turn bar; they might give a boost to attack or defense to whichever character (or enemy!) is acting at the time, grant them another turn, or cause helpful or harmful status effects. Because Gaia icons affect both party members and enemies alike, it pays to try and time your turns so that your characters align with favourable icons — if you see a 'Action x2' coming up, you might tell a party member to take a light turn to hopefully hop over an enemy on the turn bar and snag the boost; if you see a 'Defense -2' on the horizon, you might try wasting time to make sure it falls on an enemy turn first. Even though we can imagine better implementations of the system — the icons are tiny, so it's not always immediately clear what each one will do, or how exactly each action will affect the turn order — we enjoyed what Gaia Icons brought to the table. Based on how closely you pay attention to them, they can add either timing-based strategy or a fruit-machine-style element of randomness to combat, and both help Infinite Dunamis stand out from other budget JRPGs. They're also handled in a wonderfully on-theme way; Gaia Icons pop up more frequently in battle locations where humans have upset the natural balance of the world, so mines and factories will see much more of their effects than forests and mountains. Another pleasant connection between story and gameplay comes in how you'll customize Estelle's abilities. Apparently half-robots don't get as much out of leveling up as humans do, but she's able to make up for it by equipping different 'crystals', 'cores', and 'souls' into her cyborg frame, which increase her stats and abilities according to their individual properties. Rather than just buying them from the shop, you'll find these parts scattered around the world, as well as dropped from enemies, so hunting for new crystals and cores gives exploring and random battles a nice extra sense of purpose. Finally, Estelle and everyone else can learn new skills through a proficiency system lifted from Final Fantasy IX: skills are tied to weapons, and by fighting with those weapons equipped, you'll raise your proficiency level with their accompanying skills. Once you hit 100% you can use the skill without the weapon equipped, freeing your character up to learn more moves from different equipment. It may be a borrowed idea, but it's borrowed for a reason; it's a fun way to customize your characters, it adds another dimension to weapon selection beyond simple attack stats, and it makes random encounters useful for growing your party's skillset as well as their levels. Infinite Dunamis also adds a welcome tweak, in letting your proficiency go above 100% for enhanced abilities, giving you a reason to stick with certain weapons after you've learned their skills. Magic is learned through a similar technique of equipping and leveling up elemental rings, with wearing multiple rings granting more powerful spells. 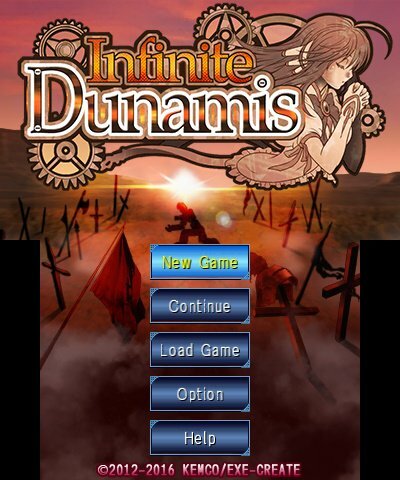 These are thoughtful systems, and they come together well, but what stood out most in Infinite Dunamis — especially compared to its mobile-port JRPG peers — is its lighthearted sense of fun that carries through the experience. The first magic user you'll meet, for instance — a notably inquisitive youngster — has spells with names like 'What just happened? ', 'What's that? ', and 'What are you saying? ', which trigger random effects, change enemy direction, and steal SP while inspiring Rage, respectively. 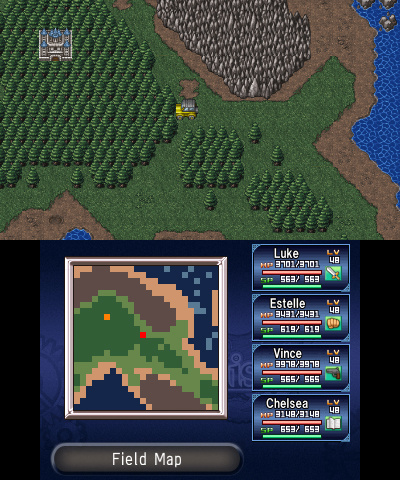 Status screens show not just HP and EXP levels, but also trading card-style stats and personality quirks: Luke "Likes tinkering, hates people", while young-looking mage Chelsea's age is listed as "Shut up!". And the helpful 'Quest' menu option which reminds you what you need to do next on your journey does so in a cute, first-person narrative style that reads like Luke's diary. These small touches in the writing go a long way towards giving Infinite Dunamis a personality its peers often lack. We have a lot of praise for Infinite Dunamis, but it's not all roses, and its appealing writing and fun battle ideas are unfortunately backed up by a decidedly subpar presentation. There's no 3D effect, for a start, and though that might be a predictable effect of its mobile origins, the stuttering framerate is not. As in Alphadia, moving around towns and the overworld is a stuttering experience that feels like characters are teleporting between frames, and it never stops being distracting. It's compounded by the heavily tiled, RPG Maker-style backgrounds, which create a sort of unintentional '3D picture' effect when you move over them with the constant frame-skip, and mirrored in a general lack of polish in many areas; the frequent occurrence of a fixed-width, white-on-black 'Now loading…' screen is just one example. 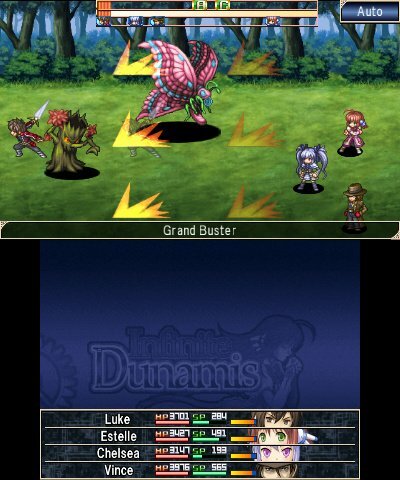 On the plus side, battles look better, with an early Final Fantasy-esque right-to-left orientation and some nice animations, which include your party members actually attacking enemies instead of just bumping a bit in their general direction. The sprites are nice and characterful too — we loved seeing Charlotte bash enemies with her massive book — and the 2D character portraits used in the talking head cutscenes are well drawn and crisply presented. The audio side of Infinite Dunamis sadly mirrors the choppier side of the graphical presentation. The music itself is quite nice, with rocking battle themes, whistly overworld melodies, and Haydn-esque town tunes on (synth) harpsichord and strings, but the loops are relatively short and far from seamless; tracks end jarringly and jump back in at the beginning after a short but salient pause. Sound effects are similarly incongruous — the cheery little 'battle begin' jingle caught us off-guard every time, and the treasure chest theme happily steamrolls over whatever music is playing in the background, no matter the key or meter. 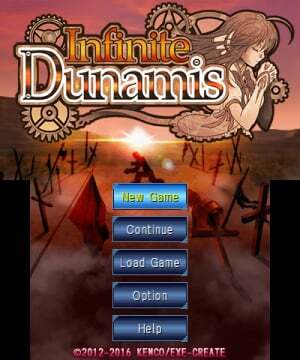 Infinite Dunamis gives players exactly what it promises: a turn-based, nostalgia-heavy JRPG that hearkens back to the 16-bit era. It suffers from many of the same presentational pitfalls as its fellow mobile ports, including jittery movement, generic-looking backgrounds and a pervading lack of polish, but it also introduces some genuinely interesting ideas, like the timing-based power ups of its 'Gaia Icons', and boasts competent, characterful writing. There are far better role-playing experiences on the 3DS, but for turn-based world-saving on the cheap, Infinite Dunamis is a fine option. With a love of anthropomorphic stars and an annual Christmas NiGHTS routine, scientists claim Morgan's smile is powered by sunshine and rainbows. 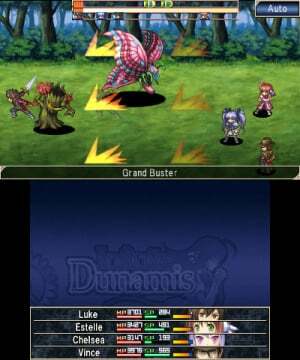 Eh.... another HD version SNES RPG style again ? "But come with some unique touches. For starters, you'll have both vanguard and rearguard positions to work with in your partyard." Not sure how that's unique, I was fiddling with front and back rows over twenty years ago in Final Fantasy VI. Nonetheless, game sounds pretty fun. It seems the quality of Kemco releases lately is steadily getting better. I remember playing through some of their earlier releases on Android and thinking that they could be on to something if they just pushed the envelope a little. After reading this review I think I might give them another try. Great review. The first half caught me up, but the later parts of the review sound pretty serious. Can anyone compare this games 'issues' to, say, Grinisia? That's pretty much the only other one of these eshop rpg ports I've played. The logo looks like it is nicked from The Last story! @Morph Yeah, it read like at least a 7 or even an 8. The only drawback or negative point were the stuttering which definitely means a 1 point less, and I might add that the lack of 3D paired with long times means another point less, bringing into 8. If we were to take a whole point for lack of 3D graphics, then a lot of very good games would get 7s and 8s. @Malakai How much it costs? 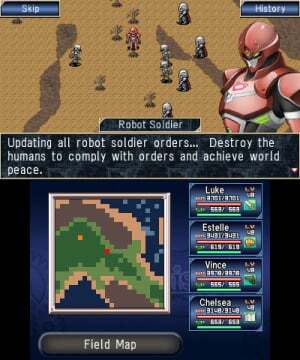 Hey, someone got RPG maker to work on 3DS? They should share that info. @Drac_Mazoku I wasn't sure of this game's worth because the score makes it look like the problems are standing out. But since my favourite Mazoku is entertained, I'll give it a try. Well thank you If you come to this with the right expectation level (mainly the graphical hiccup coming from an old japanese mobile port), you'll be having a blast if you're a fan of old school JRPG. Its strong points really come in the customization levels you have over your characters.